Windows can do all sorts of amazing things, some of which you might actually want it to do. Unfortunately, the things you don't want it to do can slow it down. By turning off unnecessary programs, processes, and services, you can unburden Windows and help it live up to its full potential. Some of the following suggestions may not produce a noticeable improvement in performance individually. But their cumulative effect can be to speed up your system significantly. You don't have to turn off all of these features, mind you. Most of them are useful--or at least aesthetically pleasing--to some people, but pointless to others. I've tried to provide enough information to enable you to make an informed decision about which ones to keep. To help you follow my suggestions more easily, I've organized the questionable features in my list by the Windows location where you must go to turn them off. That way, you won't have to visit the Windows Features dialog box, or Services, more than once. You can turn off many features from the System Properties dialog box. You've almost certainly been here before. This is where you change your network ID, manage System Restore, and launch Device Manager. You can also shut off some unnecessary features here. 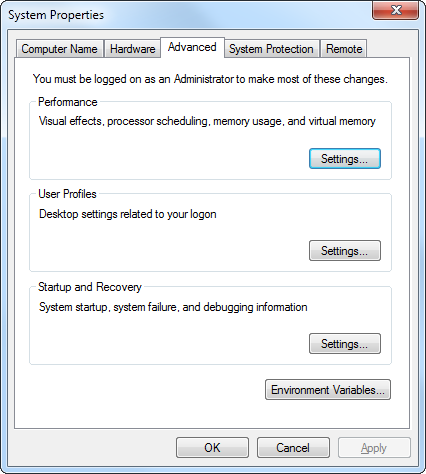 To get to the System Properties dialog box in Vista or Windows 7, click Start, right-click Computer, and select Properties. Then click one of three links--Remote settings, System protection, or Advanced system settings--in the left pane. Alternatively, click Start, type sysdm.cpl, and press Enter. In XP, click Start, right-click My Computer, and select Properties. Or click Start, Run, type sysdm.cpl, and press Enter. Windows doesn't have to look as pretty as it does to do its job. And some aesthetic compromises can free up precious processor clock cycles for real work. To see your options for turning off these extras, click the System Properties dialog box's Advanced tab, and then click the Settings button inside the Performance box. This brings up another dialog box, where you can select which visual effects to keep and which to lose. Select Adjust for best performance to turn off all of them, or individually uncheck the ones you don't care for. Turn off Error Reporting to speed up XP a bit. You've probably noticed that both Windows and the programs that run on it occasionally make mistakes. When that happens, the operating system attempts to send a report back to Microsoft. In theory, your report helps the company find bugs and improve future versions. Whether that reporting system really helps is open to debate. It certainly doesn't help you in the short run. If you'd rather get on with your work after something goes wrong, you can disable error reporting. To do so in XP, click the System Properties dialog box's Advanced tab, click the Error Reporting button in the lower-right corner, and select Disable error reporting. I recommend keeping 'But notify me when critical errors occur' checked. 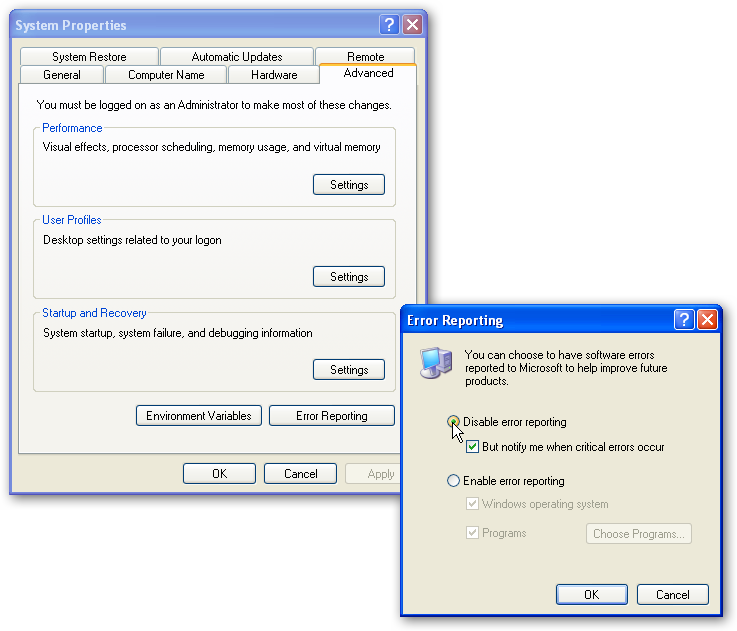 You can also turn off error reporting in Vista and Windows 7, but not from this dialog box. I explain how to proceed in the Services section. If you're not providing or receiving long-distance support, or if you use a third-party tool to provide that support, there's no reason to leave the Remote Assistance feature on. To turn it off, click the System Properties dialog box's Remote tab. Uncheck Allow Remote Assistance connections to this computer (in Vista or Windows 7) or Allow Remote Assistance invitations to be sent from this computer (in XP). This handy box, semi-hidden in Vista and Windows 7, gives you on/off control over a multitude of features. You can control what games are available, turn on RIP Listener (which isn't nearly as macabre as it sounds), and turn off some resource-wasting services. XP users can skip this section, entirely--this dialog box was added with Vista. To open the Windows Features dialog box, click Start, type programs and features, and press Enter. Once the 'Uninstall or change a program' application comes up, click Turn Windows features on or off in the left pane. Windows 7 users can take a quicker alternative route: Click Start, type windows features, and select Turn Windows features on or off. One warning: This dialog box takes a long time to load; and when you're done with it and click OK, it takes an even longer time to close. Then it usually reboots the PC. Consequently it's best to make all of these changes at one time. Don't use Internet Printing? Turn it off. Do you ever print documents over the Internet? If not, you're unlikely to miss Windows' Internet Printing Client. To turn it off, first find and expand the Windows Features dialog box's Print Services (or Print and Document Services) listing. 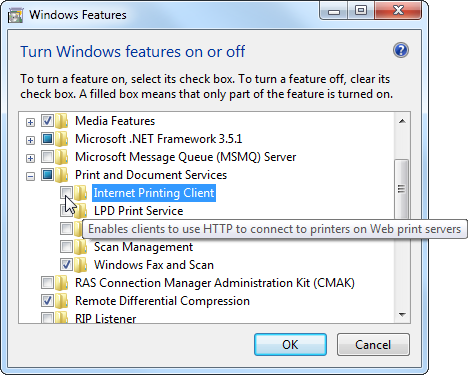 Then uncheck Internet Printing Client. If you're working on collaborative projects with other Vista users, Meeting Space is a handy program to have around. It lets you share files across a network while editing them with a remote colleague. A lot of people were disappointed with Microsoft dropped Meeting Space from Windows 7. But, if you're not working on collaborative projects with other Vista users, Meeting Space is just a waste of resources. To disable it, simply uncheck Windows Meeting Space in the Windows Features dialog box. Turn off Tablet PC extras, part 1. In the long-ago days before the iPad, a tablet PC was a laptop with a touchscreen that could rotate 180 degrees and fold down over the keyboard. With those rather bulky and heavy tablets in mind, Windows offers some very good tools for touchscreen interfaces. I'm actually writing this article on such a computer, and though I seldom fold it down into tablet mode, I wouldn't dream of turning off those enhancements. However, if your computer lacks a touchscreen, you have no reason to leave them on. This is a two-step process that starts in the Windows Features dialog box. Start by unchecking Tablet PC Optional Components (Vista) or Tablet PC Components (Windows 7). See the Services section on the next page for part 2 of this tip.